Choosing the engine for your narrowboat. Obviously the most popular choice is the modern Diesel engine. Easy and cheap to run, these are "High Speed" engines, running at around two to four thousand RPM. 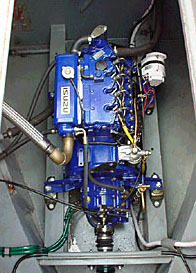 These engines can be bought specifically for Marine use, or a standard engine can be obtained and converted. When choosing you engine, your best bet is to choose a higher powered engine, which will run quieter, have power in reserve for emergencies or windy weather, and also increase the sale ability of your craft when you finally decide it's time to move on. The downside to this is that larger engines require a bigger propeller, and thus your boat must lie lower in the water, meaning more weight and resistance from the water in motion. Modern diesel engines will fit easily under the deck of cruiser and semi-trad boats, and in a box in the rear cabin in traditional barges. Increasingly popular among the traditionalists of narrow boating, these engines are also becoming increasingly rare. It is still possible to find these engines as many are being tracked down overseas, and returned to the UK by several operators. Obviously vintage Diesels are more expensive to find and maintain than their modern counterparts, and are also often less powerful. They do however in general have a much lower speed, higher torque and weight, and always provide that classic Diesel noise so many boaters love. Many owners choose to show off their engines with side doors opening directly onto the engine room to allow passers-by to see exactly what's going on. The Original form of mechanical propulsion for canal barges, Steam engines have a huge number of drawbacks in the space they take up, and their fuel store, but are often popular for the fantastically"retro" sound and the smell of burning wood or coal. This is not an engine type for the faint hearted, and it is recommended that you seek advice from a specialist steam power organization before you embark on this massive task. Another unusual method of propulsion for narrow boats, mainly due to a lack of recharging points along the canal. There is a very limited range on electric boats without recharging, and this has been a problem that prevents them being a really mainstream consideration. Only a realistic consideration for the shortest of narrow boats, outboards are a cheap propulsion option, with several distinct advantages. They do not require a shaft, propeller or rudder, and there is no space taken up inside the boat, however they do have a limited life span, run on petrol which is often not readily available on the canal side, and are vulnerable to theft.